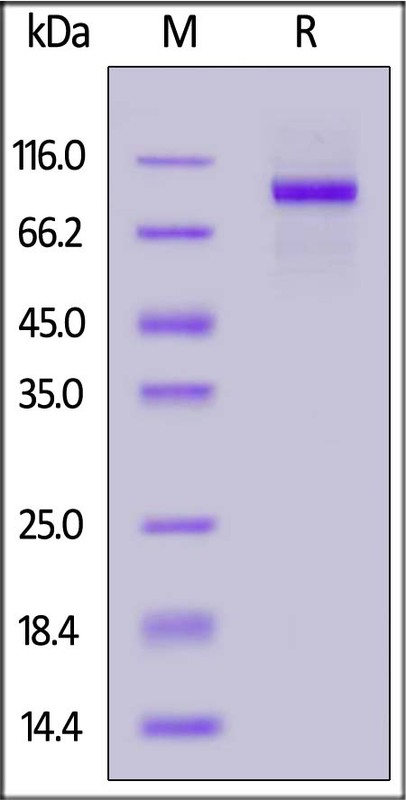 Biotinylated Human G-CSF R, His Tag, Avi Tag (GCR-H82E4) is expressed from human 293 cells (HEK293). It contains AA Glu 25 - Pro 621 (Accession # NP_000751). The protein has a calculated MW of 69.2 kDa. The protein migrates as 72-85 kDa under reducing (R) condition (SDS-PAGE) due to glycosylation. 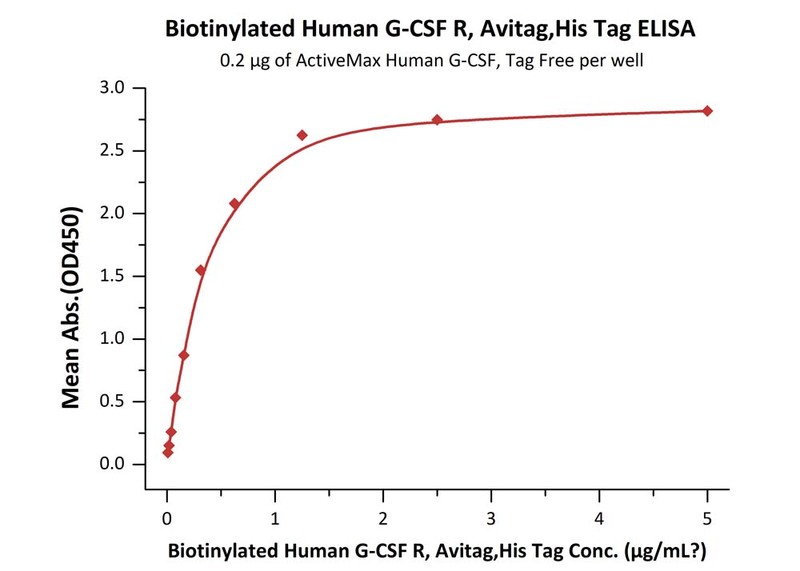 Biotinylated Human G-CSF R, His Tag, Avi Tag on SDS-PAGE under reducing (R) condition. The gel was stained overnight with Coomassie Blue. The purity of the protein is greater than 95%. The granulocyte colony-stimulating factor receptor (G-CSF-R) also known as CD114 (Cluster of Differentiation 114) is a protein that is encoded by the CSF3R gene. G-CSF-R is a cell-surface receptor for the granulocyte colony-stimulating factor (G-CSF). The G-CSF receptors belongs to a family of cytokine receptors known as the hematopoietin receptor family. Granulocyte colony-stimulating factor receptor has been shown to interact with Grb2, HCK and SHC1. The granulocyte colony-stimulating factor receptor is present on precursor cells in the bone marrow, and, in response to stimulation by G-CSF, initiates cell proliferation and differentiation into mature neutrophilic granulocytes and macrophages. (1) Zeidler C., Welte K., 2002, Semin. Hematol., 39 (2): 82-88. (2) Beekman R., Touw IP., 2010, Blood, 115 (25): 5131-5136. (3) Ehlers S., 2010, J. Clin. Oncol., 28 (15): 2591-2597.